I’ve actually got a lot on my plate at the moment where blogging is concerned as I’m constantly busy with some group or the other. Initially I was two minded about joining this group simply because I thought I may not be able to cope. However, the main reason I joined is that I have bookmarked so many recipes from fellow bloggers that I rarely get the opportunity to go back to them and actually make it. However, this group gives me that opportunity. This is my first entry for the group and I was paired with Sasmita who blogs at First Timer Cook. Her blog is full of recipes both Indian and International Vegetarian Dishes. I love her photos and how she sometimes uses unique ingredients. One of the recipes I had bookmarked from her blog was Sanna. Last year at my daughter’s best friends wedding reception I got the opportunity to taste sanna. I had heard about this rice coconut steamed Goan/Mangalorean Catholic speciality. At the reception, when I took 2 I thought they were idlis. However on tasting it, it was different. I asked the waiter who was serving the food what it was and he replied ‘madam its sanna, and its our speciality’. I enjoyed sanna with some coconut stew. When I browsed the internet for sanna recipes most had toddy as the ingredient and I thought ‘where am I going to get that from’, and left it at that. Sasmita blogs sanna for another group challenge and I immediately bookmarked the recipe. What I also liked that instead of making them in an idli mold she used the silicon cake cups. So here’s the recipe for the delicious sanna which even my hubby loved so much. I served it with some benasthali, a Goan veg curry. Sanna is also enjoyed as a breakfast dish with some sugar/jaggery and milk or with sambhar and chutney. Sweet sannas are made by adding jaggery to the batter before steaming it. Sasmita thank you so much for sharing such an easy and delicious sanna recipe. Soak the rice overnight in some water. Next day drain out the water and wash the rice. Put it in the blender with the grated coconut and water. Blend till you get a fine smooth thick batter. Remove the batter from the blender into a big bowl. Add sugar, salt and instant yeast. Mix well. Cover the bowl with a lid or cling film and set it aside for the batter to ferment. This will take about 2-3 hours. The batter should be really frothy and double in size. Don’t mix it too much. Prepare the steamer. I used a big pan and filled it with water about 3″ deep. I placed a steaming plate in it. Place the molds in the plate. Add about 2 tablespoonful of the batter or fill it ¾ full. Cover the pan with a lid and steam the sanna for 10-15 minutes. Remove the sauna from the mold and keep it a bowl covered with a tea towel. Repeat steps 12-15 with the remaining batter. Remember to add water in the pan if it nearly gets over. Serve sanna with some curry of your choice. The batter should be like the idli dosa batter consistency. 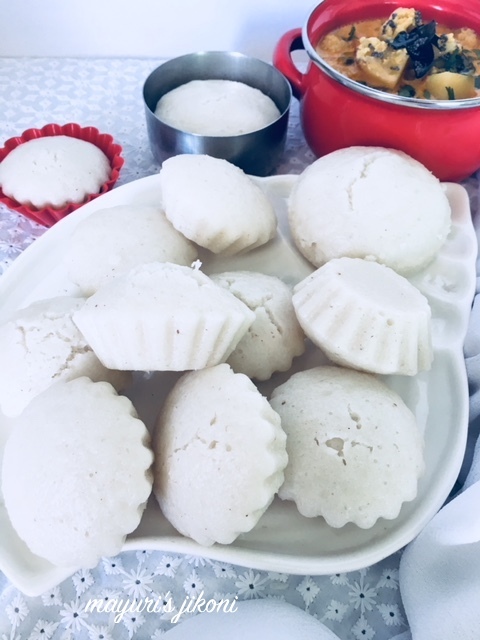 You can make them in an idli steamer, use small steel or aluminum bowls or ramekins. Add more water when grinding if required. I steamed the leftover sanna again for 5 minutes and we enjoyed it with some chutney. If you use normal active dry yeast then you will need to ferment it before adding to the batter. Add the yeast to little warm water with 1 tsp sugar. Cover and let it sit for 10-15 minutes till it becomes frothy. Add this to the batter and mix well. These were really delicious with the coconut curry you made. These look just like idlis .. amazing to see similarities in various cuisines. Thanks Shobha and that’s so true. I like the sound of sanna. Rice and coconut is a nice combination and if served if some sort of a sambar would be great!! Lately, I too have started using the silicon moulds as they are a lot easier for demoulding. LOve the new look of your blog. Mina thank you so much. The sanna came off so easily from the silicon molds and didn’t even need to grease them. The few I made in the steel bowl, very a little difficult to remove. Had to wait till they cooled down completely. The Steamed Cakes look so similar to idly but loved how different they are. Made with coconut!! Thanks for sharing. Thank you Sandhya and you’re welcome. Wow, sanna look so much like idli – soft, fluffy and absolutely delicious. I’ve heard about these but never tried them myself. You are tempting me to give these a try some time soon. Thanks Pavani. Give them a try.. your family and you will like it. These steamed cakes are in my to do list since a while, now you are tempting me to make some soon Mayuri. You nailed them prefectly. They looks damn soft and fabulous. Thanks Sujata..they do taste different from idlis. Thanks Freda, will have to try the stuffed version. Thanks Uma, still have to try making pundi. Perfectly done.. Should try this sometime. Sanna cake looks so soft and delicious. Good to know this, should give a try sometime. They look so tempting and cute. Will love to try them soon. Certainly looks like idli but the recipe seems either ways. You have done full justice to her recipe. And the goal stew is what I am after. Can you share your recipe?! Thanks Avin, the recipe will be up on the blog soon. sama rice cake looks so beautiful in shape and texture. Looks kind of idli. Very good share for fasting time. I think you misread the ingredients. Its got rice which cannot be used for fasting. , idli in this totally diff taste and texture are one of my fav these days, lovely preparation di !! Palak added to any recipe is so much nutritious… i am sure your recipe is a superhit. I have had Sanna many times but have not tried it yet. Your perfect looking Sanna with Sasmita’s recipe are now giving me cooking goals. My motivation in joining the group was also partly getting started on the to-do list which was growing longer by the minute. Thanks Aruna, do try them as they are easy to make and I loved her idea of making them in the silicon mold as they came off so easily. They look damn soft. Marked this recipe to try as breakfast option. Thank you so much Parul. Do let me know when you try the recipe out. I’ve never tasted Sanna cake, sounds interesting. Recipe seems so easy and hassle free. Thanks Jagruti. If you make idli at home then this is as easy. The name of the dish sounds interesting and yummy. It looks similar to idly but loved this different version that made with coconut!! Beautiful share. I have no idea why my earlier long comment didnt get through here. sigh! I absolutely loved the recipe and the cute looking sannas. I agree, this theme in particular, brings out the best in us as we keep bookmarking so many recipes that get side tracked due to our busy schedule or blog content. Now, every month, we can focus on something we have been wanting to try since long. The idlis look really soft and would go with an authentic goan curry or simply a coconut chutney for breakfast. We both pickled Goan Cuisine for this challenge, by the way! Haha.. Cheers! Thanks Vidya.. yes we picked Goan cuisine. I’d wanted to make sanna ever since I tasted them in Bangalore. My pleasure and me having majority Goan friends, have been eating this since my school / college days. The sanna has come out really very well!Looks pristine white as Jasmine and lovely and fragrant! Thanks Amrita, fragrant they were because of the coconut.